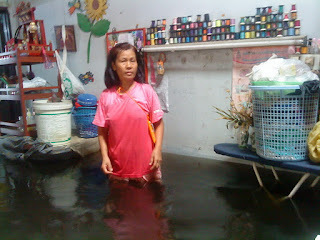 The effects of the worst floods in 50 years continue to be felt throughout Thailand. More than 700 people lost their lives. Hundreds of factories closed; some still are. Prices are higher across the board. In response to this crisis, we decided in October 2011 to donate 10% of all TAMMACHAT Natural Textiles’ show revenues in November to Thai flood relief. While the producer groups with whom we work are not in the central areas most severely impacted by the months of floods, our close watch of events made us aware of the millions who were. When we arrived in Thailand in December, we contacted HomeNet Thailand to see if our donation could help them in their work. On previous trips we had visited their office in the north of Bangkok (one of the areas hit by the floods) to meet with the Director, Poonsap Tulaphan, who has also been involved for decades with one of the weaving co-operatives with whom we work. HomeNet works with about 200 groups in Thailand whose members total more than 7,000. These workers not only suffer the pressure and insecurity that result from payment by the piece; they must also supply their own workplaces and equipment. We learned that HomeNet is currently working with more than 20 groups on the outskirts of Bangkok whose 400+ members were directly affected by the recent floods. Many of these are handicraft producers, but also include groups whose members do piece-work sewing and sweets-making. The floods not only displaced their families; they also damaged their equipment and supplies. As a result, HomeNet is providing these groups more than 1 million baht (approx. $33,000 CAD) for microcredit loans to replace equipment damaged or destroyed in the floods. TAMMACHAT’s donation went into this fund to provide loans to women that are essential to restart their work --- without resorting to usurious moneylenders. When members are again producing, they will repay their loans to the group so that other members can also re-capitalize their home-based businesses. Our contribution is a small step towards helping those facing huge losses. Thanks to TAMMACHAT’s customers for their support.